Hey everyone. Today I have nails from quite some time ago - a couple of months, I think. 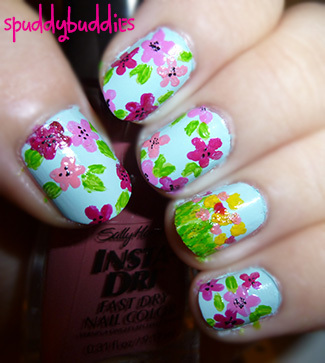 It's another whimsy floral design, nothing too hard to accomplish if you're looking to try this design out. 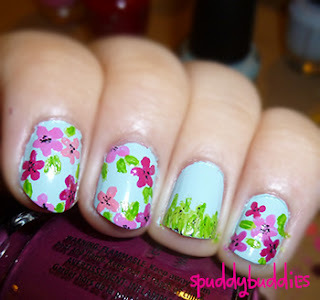 I started out with Love & Beauty - pale blue as a base for all my nails. I used 2 coats. 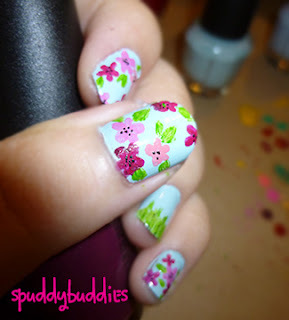 Then I used a nail art brush to create the flowers with different pink polishes (I can't remember what colors I used, sorry!). Against the blue base, the pink polish turned kinda purple as you can see in the photos. I covered the black polish up with a darker green polish which I also used to create some depth in the leaves. 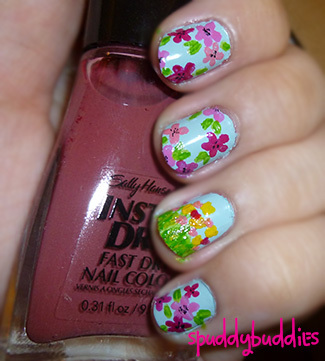 Then I dabbed on some random yellow, pink and red polish to create my tulip garden. Part of the idea to paint a tulip garden came from an art class I took in college. I really enjoyed studying the Impressionist-era paintings; I thought the style was so me - big brush strokes, vivid colors, spontaneous painting. So the tulip garden was kind of my Monet moment, I suppose..? Haha. I love this last photo best. The sunlight wasn't too strong and it seems to be giving this ethereal glow which is so pretty! 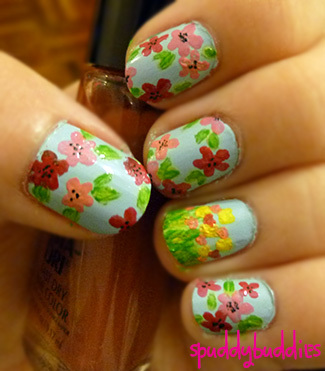 What do you think of this floral nail design? 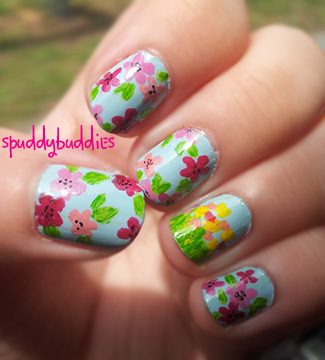 If you'd like to see a tutorial, just leave a comment and I'll do a step-by-step.